NFL Lockout: Why Pros Still Show To Off-Season Workouts : The Two-Way In the end, it's about the money. One player alone gets a $750,000 bonus for showing up to 85 percent of the workouts. 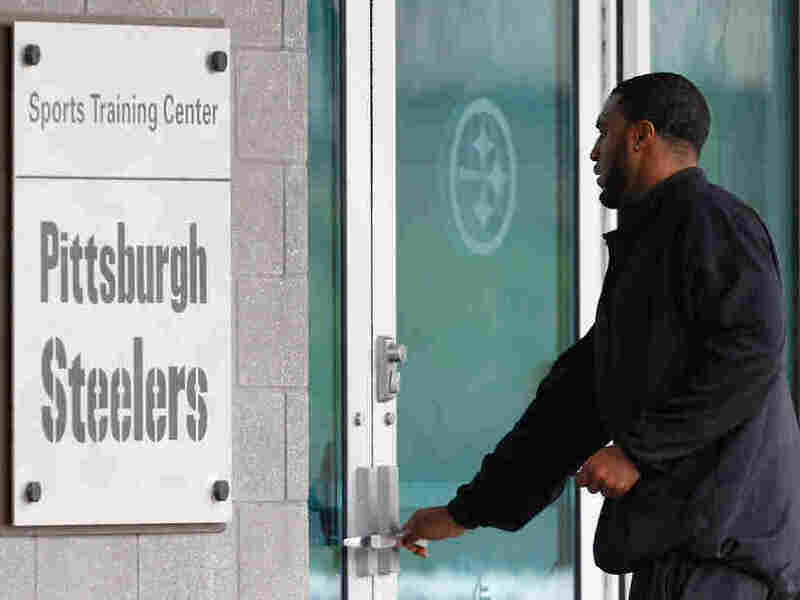 A day after the NFL lockout ended, Ryan Mundy of the Pittsburgh Steelers reports to the South Side training facility. In the past, we rarely heard or cared about what NFL players did during the spring and early summer. Consider what we heard recently from Chicago offensive lineman J'Marcus Webb, when he was asked about being locked out of team facilities. "It drives me insane, that's what it does," said Webb, adding, "I'm trying to eat healthy and work out, do my job and right now, I'm just stuck at home working out and watching cartoons all day." Official off-season workouts, at team facilities, are not just something to steer big men away from little boy diversions. It turns out it pays to be fit --sometimes more than you can imagine. It was earlier this week, when confusion reigned. U.S. District Judge Susan Nelson granted an injunction that lifted the lockout, and the next morning, some players started showing up at team facilities. The facilities were open --kind of. Players still weren't able to get into the weightrooms. 27-year-old D'Brickashaw Ferguson, a premiere left tackle for the New York Jets, spoke to reporters after being told he couldn't work out. "They stated that while it's still a pending matter, they're not going to be letting players work out," Ferguson said. "So, I don't know if that makes sense. Maybe tomorrow I'll brush my hair differently and they'll let me in!" At that point, getting in wasn't as important as being there at the facility in New Jersey — day after day-- until the confusion ended. "I would hate for them to say well y'know, he showed up that first day Brad, but then he stopped showing up. So he didn't get 85 percent," says Brad Blank, Ferguson's agent. 85 percent is Ferguson's magic number, which leads to the more magic number of 750,000. That's $750,000, the bonus money Ferguson makes if he takes part in 85 percent of offseason workouts. It's the biggest offseason workout bonus in the NFL. According to Blank, the workouts usually have to be at a team facility under the guidance of a team strength coach, doing what the strength coach asks. "That could be running, it could be lifting, it could be just eating lunch," says Blank. The workouts could last 15 minutes or three hours. It's probably not the best public relations move to have the football-loving public know you're pocketing three-quarters of a million dollars for something considered a basic part of your job: Staying in shape. Especially not at a time when players are fighting with owners about how to divide $9 billion in annual NFL revenues. But Blank says neither he nor Ferguson advertised that Ferguson was getting the lucrative bonus. The media (perhaps a bored media?) seized upon something that's hardly news. "I would say in the big contracts it's fairly standard," says Blank. In fact, ESPN.com recently listed 48 other NFL'ers with off-season workout bonuses of $150,000 or more. Blank has represented football players for 30 years. He says the bonuses started in the late 1980's and early '90s, when teams saw it as a competitive advantage to have players stay in shape. Also, over the years it became a way for teams to keep tabs on their most prized investments. "I think all you have to do is look at the police blotter to recognize that a lot of players like to be out during the offseason and not in the gym," says Blank. "Many have to get bribed to be in the gym. Not D'Brickashaw. He would be there regardless I think." Tom Goldman is NPR's sports correspondent.